Pop Queen, Beyoncé Knowles-Carter and her husband rapper Jay-Z stepped out together for dinner date in his native Manhattan on Monday. The 36-year-old mother-of-three rocked pale plunging blazer that flaunted her cleavage and matching shorts which she paired with high-heeled slingbacks, a pink purse, Sunglasses and Slinky-style earrings. While her 48-year-old rap mogul husband donned an athleisure ensemble of black track pants, an Adidas baseball cap, navy Puma shoes, and a matching long-sleeved top for the dinner date. 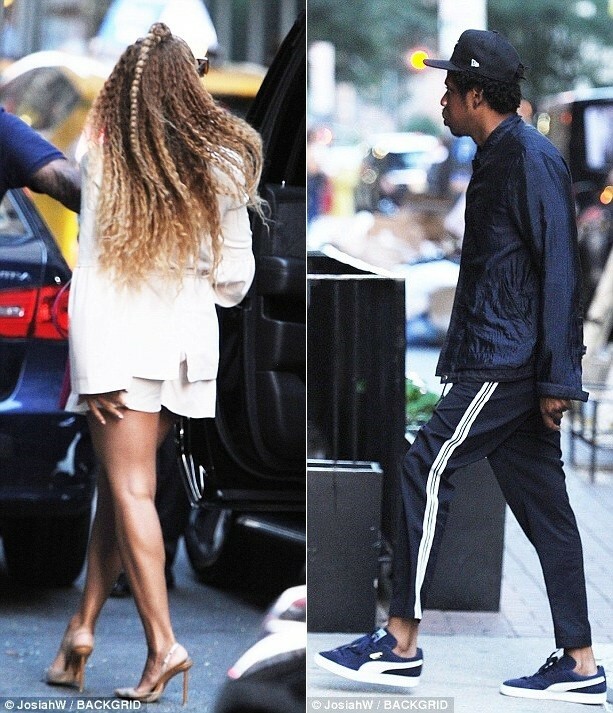 The couple where at the verge of a breakup years back after her Lemonade album revealed the dirtiest parts of their marriage saying Jay-Z was cheating on her with a certain ‘Becky with the good hair’, but it seems they’ve come back stronger than later.